Good Morning…I’m Stephen Woessner, CEO of Predictive ROI and your host for Onward Nation. I am also the author of the Amazon.com #1 best seller, “Profitable Podcasting”…and if you haven’t already done so…be sure to download your free chapter of my book at PredictiveROI.com/Resources. Okay, Onward Nation…welcome to Episode 737, which will be solocast — where it will be just you and me covering a topic that I am often asked about when meeting with prospective clients, or after a speaking engagement, or even by some Onward Nation guests during our post-interview chat. Essentially — is there a process, a plan, a strategy that business owners have used in order to get paid to create content — or — to ensure that the content they are creating is driving revenue back into their core business. It’s a big topic — and to do it justice — it needs to be sliced and diced into smaller bite-sized pieces — and that is what I am going to do during this solocast. I want us to cover this topic with some real depth today because with the right monetization strategy — you will be able to create the right content and drive revenue so that your marketing related activities are no longer seen as an expense on your P&L, but instead, part of your top line revenue. So for today, you and I are going to focus on what monetization looks like, what type of content is even monetizable, and the key ingredients to a well thought out monetization recipe. My hope is that this solocast will answer all of your questions or concerns — but please know — if you have more questions or if I didn’t address yours — you can always hit me up on LNKD or email at stephen@predictiveroi.com. Yeah, exactly…a revenue stream! That is what happens when the content you create is worthy of monetization — and it becomes possible when you get very intentional in two specific essential areas. First, you must — without question — establish a very CLEAR point-of-view for you, your business, and your team. A clearly defined and distinctive POV will differentiate you from your competitors, help you attract the right prospects to your business, and it will give you the ability to charge a premium price for your offering. POV will add value to your core business by attracting attention of the audience you have decided to focus on serving. The second area that contributes to your ability to monetize is how consistent you are at creating high-quality cornerstone content and sharing it with your audience. And each piece of that content cements your POV into the hearts and minds of the people who are following you today — or — it will also repel the prospects you don’t want to serve. This content will also attract the attention of new people…so your audience will grow. And above all else — your cornerstone content is helpful to your audience. It is not self-aggrandizing, or promotional, or egocentric at building your personal brand and platform. Instead, you should focus on being as helpful as possible to your listeners, to your audience, so that with each of your podcast episodes, or each of your blog posts, or in every one of your videos…they walk away with a lesson, or a nugget, of something they can implement into their business straightaway…that is what it means to truly add value to your audience. And when you do that…consistently…your audience grows because your audience shares your content with friends and colleagues saying, “Hey, you have to watch this video on lead gen — it is awesome and we already started implementing some of the steps and they totally work.” And you earned that share…because your video was spot on and super helpful. Okay, so what does monetization of your content look like? It would be easy to fall into the trap of thinking that you need to have a large audience to be successful in monetizing your content. But you don’t have to wait. In fact, you can’t wait until you hit some audience number benchmark. What you need is high-quality content…shared on a consistent basis…with a growing audience who loves you…across multiple channels. In fact…the more narrow, or the more niche your audience – the better. For example…one of our Predictive ROI clients who is focused on a super super niche industry is about to ink a 6-figure sponsorship of their podcast and all of the associated content around the show. Why? Because in the industry they are focused on serving — their show even though it has a small audience — is THE show and the sponsor wants access to the audience and they are willing to pay over $100,000 to gain that access. So, it is not about audience size. But what I am talking about is attracting the right people into your audience – building a nation of true fans. In my opinion, most business owners look at their own marketing through the wrong end of the lens. Meaning, they evaluate the success of their marketing efforts solely through vital metrics like website traffic, email opt-ins, click through rates, conversion rates, customer acquisition cost, lifetime value of a customer, retention rates, and so forth. But there can be more – a lot more – as it relates to your marketing’s ability to generate revenue. 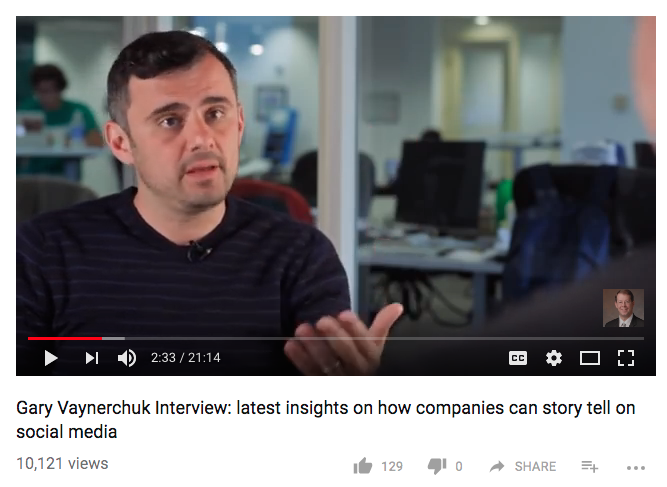 Thanks to the democratization of media channels – thanks to social media, email, podcasting, YouTube, and the myriad of other channels, today’s top business owners are now seeing themselves as media companies. Then you have successfully taken your first steps to becoming a media company where the content you produce can be monetized and generate top line revenue. But remember…I said that the second area that will impact your ability to be successful in monetizing your content, was that you need to produce content that is worthy of monetization. So let’s go deeper here and dissect what makes content worthy of monetization. First, the content you are producing must be valuable and helpful to your current audience — and – it is helpful enough that it attracts to new people into your community so your audience grows. There it is again — we must focus on our audience and being as helpful as possible to them. 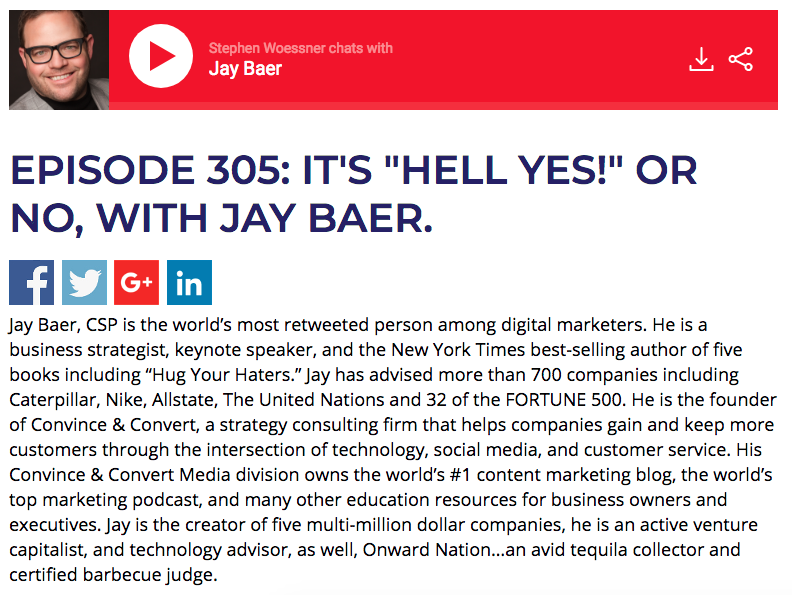 For some additional context and learning here…I highly recommend that you go back and re-listen to Episode 305 of Onward Nation where I interviewed Jay Baer. And his spot on advice was for all of us — every business owner — to give away your best stuff for free. If you’re like most business owners I spend my time with, Jay’s advice may make you a bit uncomfortable or uneasy. You might even ask yourself, “Stephen, how in the world can I give my best stuff away for free without dismantling the value proposition of hiring our company to do the work?”. Well, I can tell you based on personal experience with launching “Profitable Podcasting”, that it has been an incredible business development tool for us — and the reason why — is because the book shares each and every step of what my Predictive ROI team does for clients…in full transparency…step by step…nothing hidden. And for our right prospects…they read the book and say…this is an awesome recipe but there is no way we have the internal time or capacity to get this done…let’s just hire the experts. But it isn’t because we hid anything — it was because we gave it all away by following Jay’s advice. You know what I’m saying! This again starts with a strong point of view. Does your content provide helpful, practical, and tactical advice and recommendations that when someone finishes listening, reading, or watching that they can go implement something? “Stephen, business owners need to focus on content creation. People always think, ‘Oh, there are so many blogs! There are so many podcasts!’ The truth is, too few people are leveraging the power of content creation because we think about content the wrong way. Content creation is not about how many people view your article. When you create a piece of content, the number of people who see it doesn’t matter. What matters is whether or not you make the next sale — and it’s much more likely that you are able to do that when you can point a prospect to a piece of content that shows off how knowledgeable and credible you are. Great content is just the beginning. And it isn’t enough to consistently produce great content. Let’s say you host your podcast. Awesome. Some additional opportunities to consider would be to take the transcripts from three of your very best interviews with influential thought leaders and use the content to create an eBook with an introductory letter from you on the inside cover. Now you have an additional asset that your audience will find helpful – and – you have an additional asset a sponsor may want to be part of for a fee. Here’s another real life monetization example for you. Another Predictive ROI client just sold a $12,000 sponsorship of his podcast to one of his vendors who also wanted to get in front of his audience – and – our client sold a $10,400 sponsorship to two other vendors for an eBook. I like to call this the Trojan Horse of Sales. You can go back to Episode 600 where I broke down the recipe for the Trojan Horse of Sales step-by-step. Now that we know what the ingredients are..let’s keep refining and distilling so you can walk away from this episode with a specific recipe. Describing the ingredients is great – and examples of how others have done it – that’s great too. But maybe you’re still thinking “how can I possibly do this?” Well, it’s entirely possible and it can totally happen. This last section will show you and your team how to get started. It’s a 2 day process with you and your team – really digging in and getting things done. In the end, you will have a solid plan for creating or gathering your excellent content, spreading it across multiple channels, and turning that content into revenue. Ultimately, as a result of this process…you will be able to look at your marketing through the correct end of the lens, which will help you move your business onward to that next level because your marketing will no longer be a cost center – but a profit center for your business. For Day One…I recommend that you take a deep dive into the POV of your business. Begin the process with a deep dive into your point-of-view – your position about why you do what you do within your business. Remember, your point of view should be a bold statement about what you believe to be true. Again, it might be provocative and thought-provoking…maybe even controversial. But for those who are part of your tribe, or could be…it will be a beacon in the night for them. It’s not about the usual suspects: customer service, features, advantages, or benefits. IT IS ABOUT EXPERIENCE – why a customer chooses you over the myriad of other options in the marketplace. So ask yourself: What do you stand for? What is the flag you want to plant in firm ground? Next: who is it you want to serve? Creating a client avatar involves identifying the attributes of your ideal client. Then you need to take that a step further by converting the avatar into a list of your Dream 25 prospects – these are the people you would most like to serve as clients for your business. Next…begin identify what you and your team consider to be your three unique attributes. These are the three unique attributes to your brand – what truly makes you distinctive in the marketplace? What do you provide that no other company provides? First, we help clients get clear on their point-of-view. Second, we help them create high-quality cornerstone content that cements their POV into the hearts and minds of their audience with consistent thought leadership. Third, we help clients drive revenue by transforming their content into a Trojan Horse of Sales, which you can learn more about this strategy back in Episode 600 where I break it down in full transparency. So what are your three unique attributes? Repeat the process three times to keep peeling back the layers. And by the third time…you will arrive at something truly unique about your offering. There is just one more box that needs to be checked to complete Day One – and that is to give your process for delivering your unique attributes…a name. I encourage you to keep it simple. Simple is best because if you are not careful, it will start to sound like marketing hyperbole, a bit slick, and too showy. And you don’t need that. Okay, now you’re back for Day Two…this is where you define your cornerstone content. Or, more specifically…what type of cornerstone content you plan to create — and — how you will define success and measure your progress along the way. Or, you may enjoy aspects about both. For example, I enjoy interviewing guests for our Onward Nation episode – but – I also enjoy writing books. So for now, these are my primary cornerstones. To begin – you only need to – and only should – select one cornerstone. Then master the system and process with it before you select another one. And one of the most powerful aspects to creating high-quality cornerstone content is the amount of leverage each piece of content gives you through slicing and dicing. For example…you could take one of your podcast episodes…and transform it into 10 tweets, an eBook, top insights briefing that can be shared with your best customers, etc. One — identify your most vital priorities – the core things that you must accomplish or nothing else matters. Two — what are the measurables? How will you know when you have arrived – what does it look like? Three — what is the tactical plan? Who is going to do what, and when? Four — what are the obstacles or roadblocks that will likely rise up to get in your way – and if they do – what are the likely solutions that can be executed quickly? Five — accountability – who will be held accountable, to what, by whom, and when will checkpoint meetings or scorecard reviews be held so that progress can be evaluated and course corrections can be made if necessary? Yes, it may take you time to make this transition from your marketing efforts serving strictly as a lead generation tool over to both…generating new clients and producing content that can be monetized. But they key to remember is that it is possible – that you can begin looking at marketing through the correct end of the lens. And Katherine was 100 percent right. Guess what? I made it a priority and got it done…and so it will be airing on Thursday this week…Episode 1. Ahhh. I’m scared…but I look forward to your comments…because I know all of the thumbs up and thumbs down will help me get better and better. So, yeah, it’s scary – I get that. But when you start, and when you make mistakes, and when you make adjustments, you will also create momentum. Monetizing your content is a long-term play – but it can’t be much of anything – if you don’t ever start.